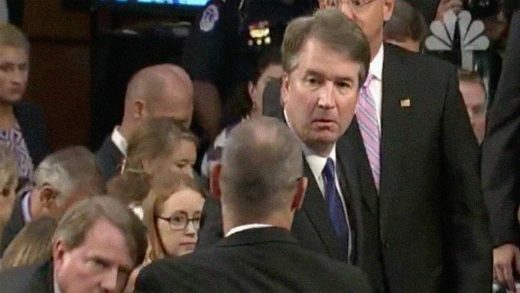 One second Supreme Court nominee Brett Kavanaugh is concluding a morning of confirmation testimony with a big toothy smile to the senators, and the next second he’s staring coldly at someone who has just identified himself as the father of one of the victims of February’s shooting massacre at Marjory Stoneman Douglas High School in Parkland, Florida. Kavanaugh appears to refuse to shake hands. NBC News posted the clip on Twitter. Per the network, the White House downplayed the incident, saying security had intervened. You can watch the clip and judge for yourself below.